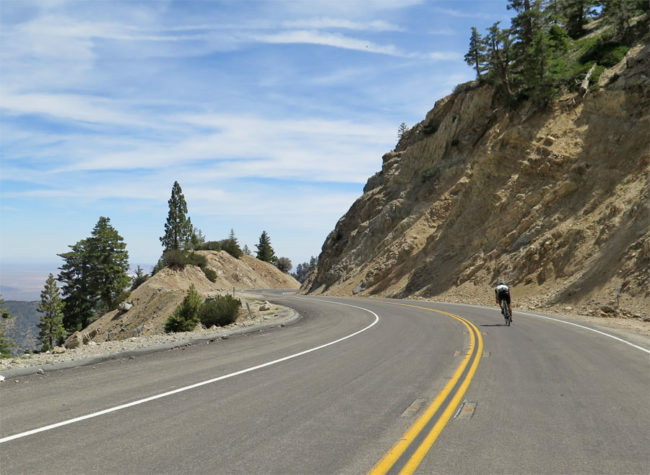 The Angeles Crest Highway is a special place to share. 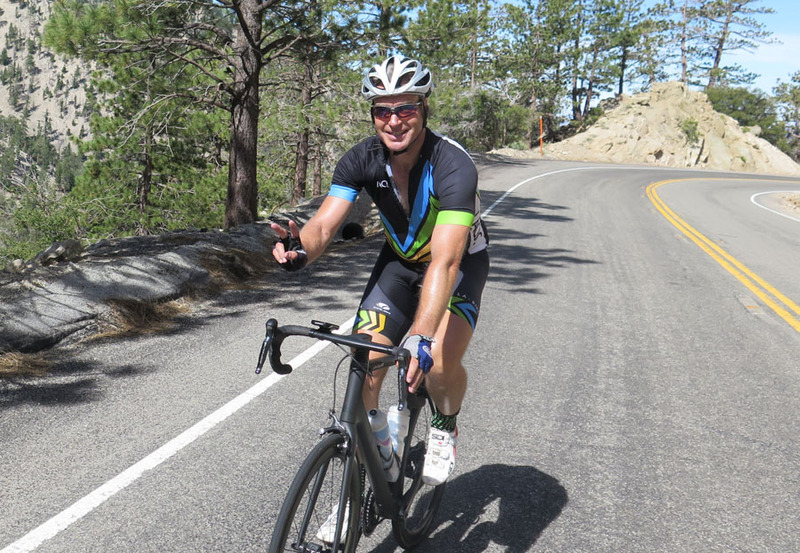 If you’ve read some of my ride reports the past few months, you’ll notice a few of them have featured my friend Bernd. We both have similar riding abilities, but he’s a much nicer person to deal with than me. Unfortunately, he’s moving back to Germany at the start of July, so I’ve been tying to get a few last rides in that he’ll remember. The furthest I’ve gone on the ‘Crest is Dawson Saddle and the one thing I learned from that experience is that the ride is more beautiful the further you go along. 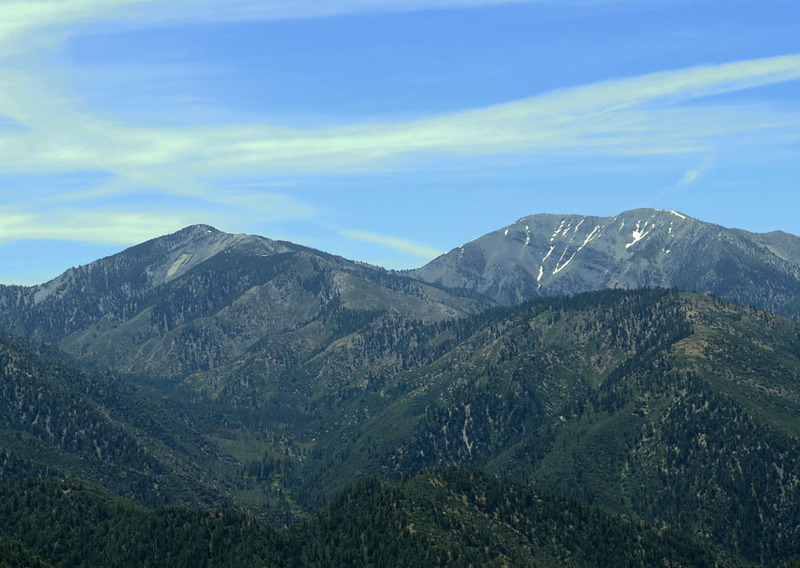 I’ve always wanted to go all the way to the eastern border of the San Gabriels, but Wrightwood would be a sufficient turning around point. 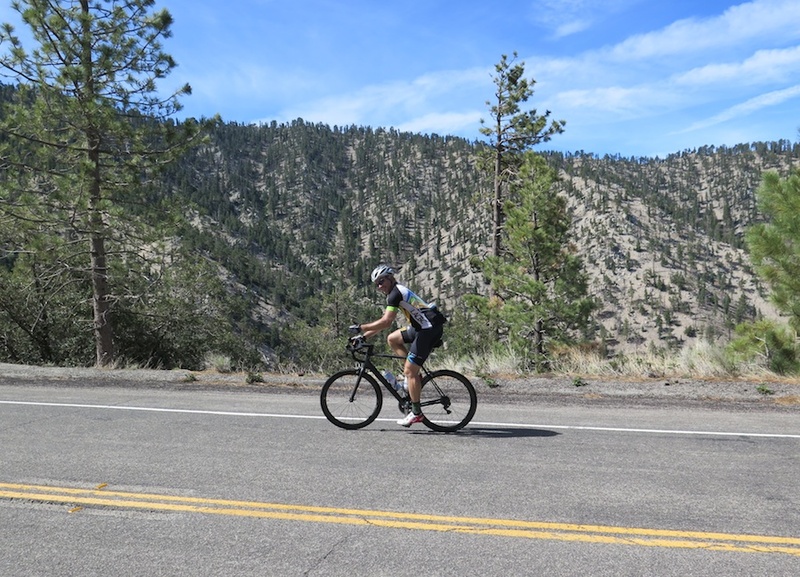 The distance to Wrightwood was 32.5 miles featuring 4300 feet of climbing there and 3700 feet on the return, with three big climbs heading east and two longer ones returning west. 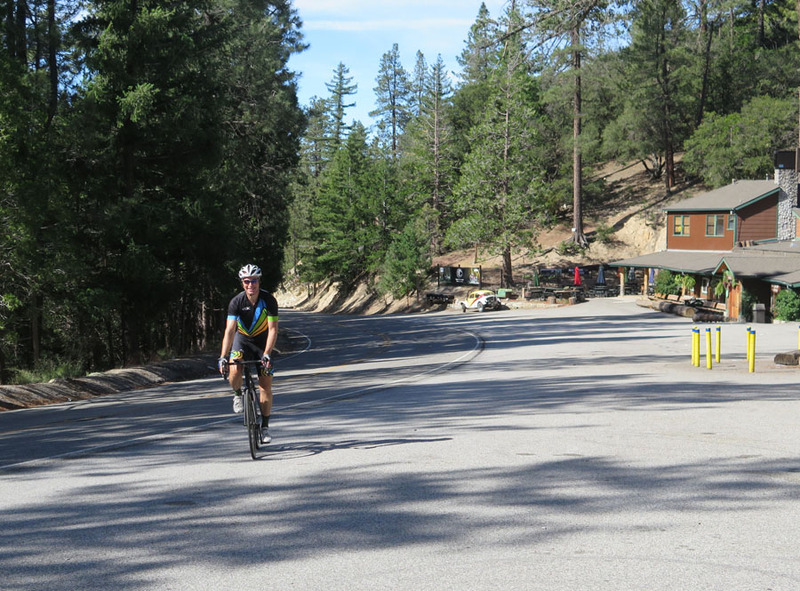 Even though it was a Tuesday, we drove up to Newcomb’s Ranch to needlessly avoid traffic that’s only prevalent on the weekends.Starting out at 5400 feet, I thought the elevation would be a bigger factor, but probably taking 15 minutes to set up our bikes helped out a bit. It was already quiet, but being surrounded by trees off the bat adds to the solitude. From the start of our ride, it took 33 minutes until we were passed by a car. That’s me. I just wanted to show you proof I was on the ride. Hello! There was a lot of time to take everything in as our first climb feet covered 1,600 feet of climbing over 6.5 miles. Even the contrails were perfectly placed to lead us forward. You don’t get the whole picture down below, but as you near the top of the climb, you realize the forest is far more spaced out as you think. If you’ve made it up to Cloudburst, then you’ve accomplished something. 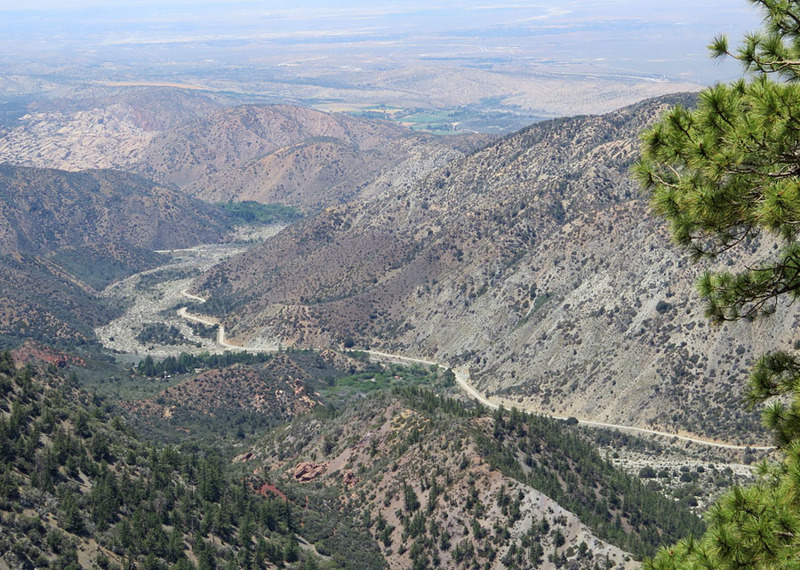 It’s a great photo op and the first time you’ll cross the Pacific Crest Trail along the way. 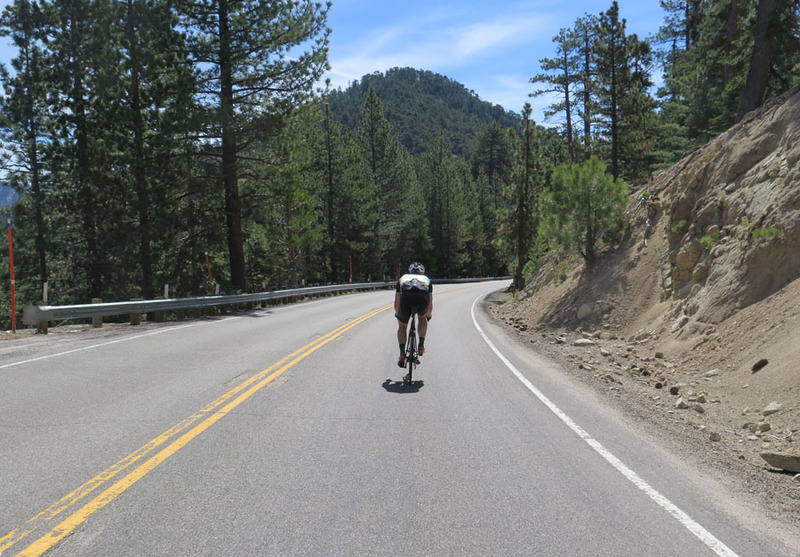 You get about a mile and a half of descending followed by rollers before your next big climb. We saw a lot more people hiking than driving on this stretch. 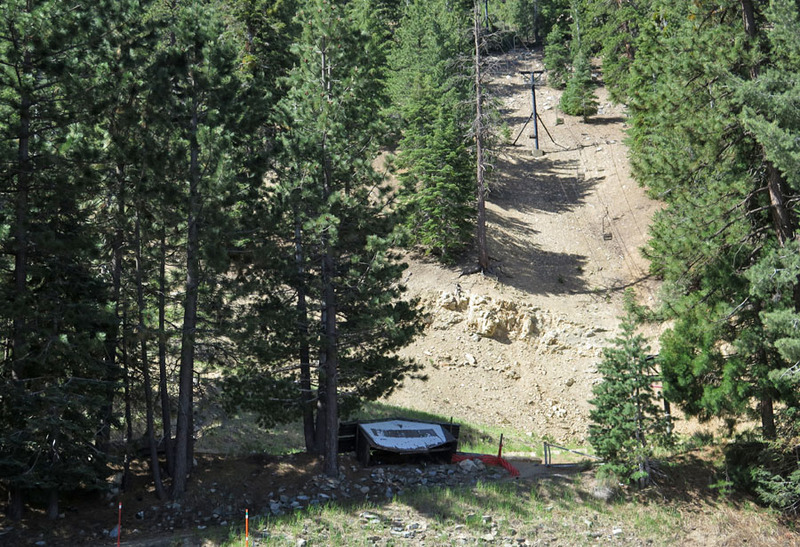 Ski season is over for Mount Waterman. Looking at Snow Crest, it never looked like it came. 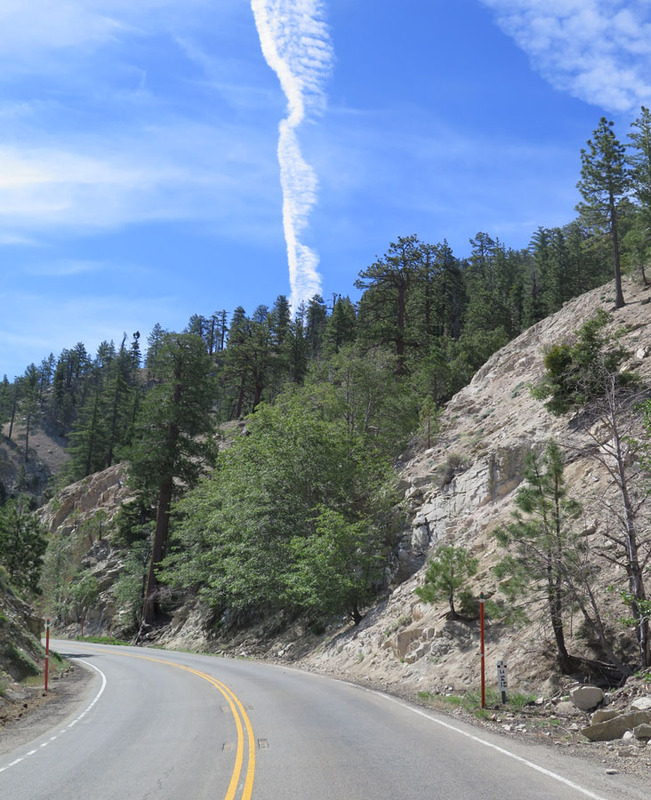 There’s some tantalizing rock formations off to the north including the Buckhorn Campground. I’d love to explore these valleys even without a bike. There were thoughts of upgrading the ‘Crest to a freeway, but I imagine they would have had to widen these tunnels. Either way, it’s a nice little piece of shade for a brief moment. We pulled over at the Jarvi Lookout to have a view of Highway 39. 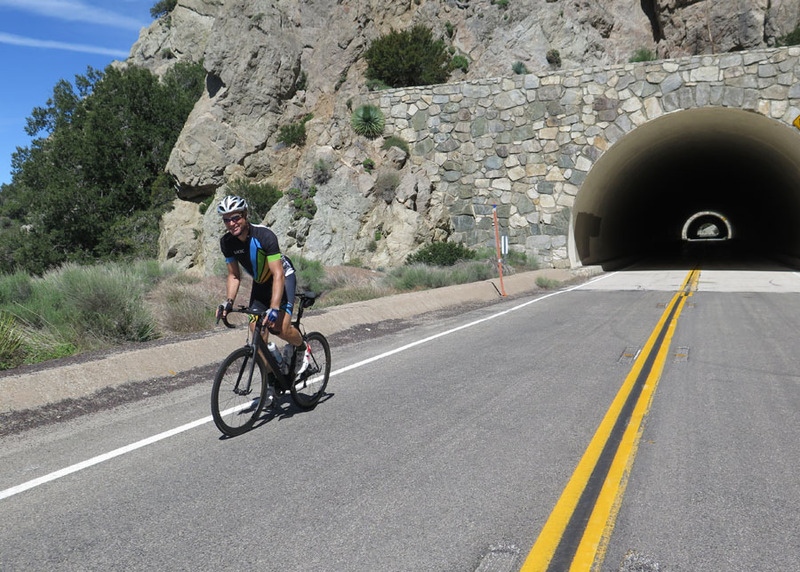 It’s closed to vehicular traffic after Crystal Lake and yes, I want to ride it. Our next climb was a bit similar covering 5.5 miles with 1,400 feet of climbing. It also has a really steady slope, but the scenery breaks that monotony. 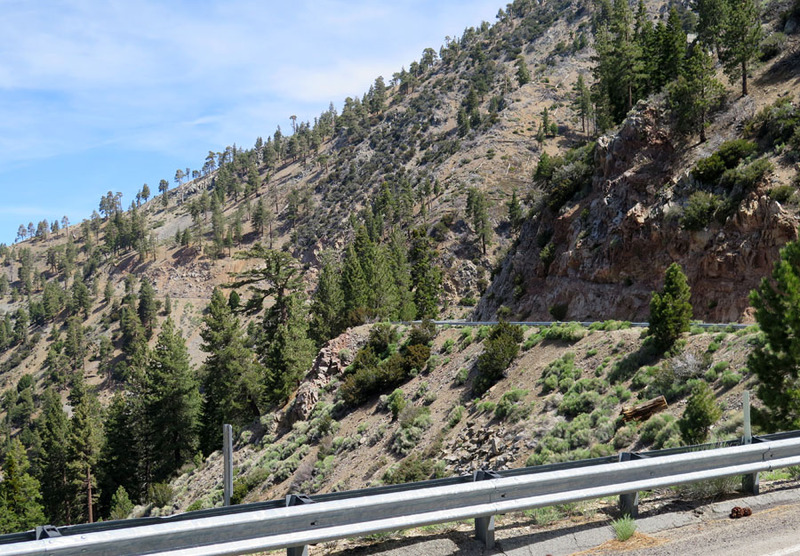 You can almost see the whole climb the entire time as the road hugs the northern side of the roadway. It gave us advanced warning if anyone was driving by which only happened twice. 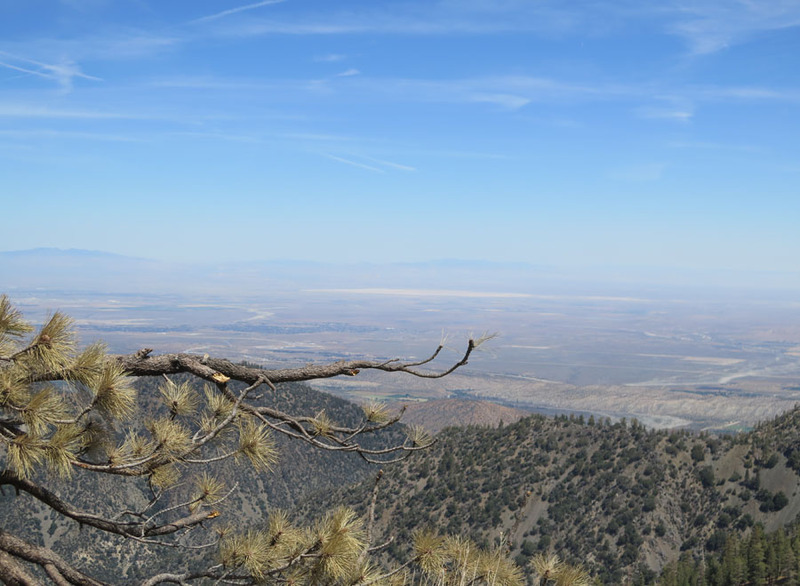 To your left, you get a celestial view of the Antelope Valley. We couldn’t see the Sierras as clearly than previous rides, but the added dust made it look more heavenly. 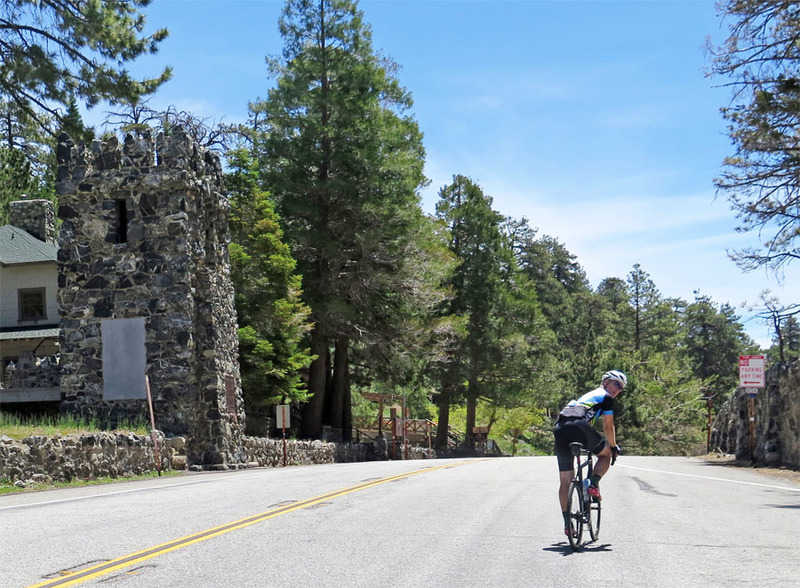 Dawson Saddle is the highest point where there is a passable road in LA County. 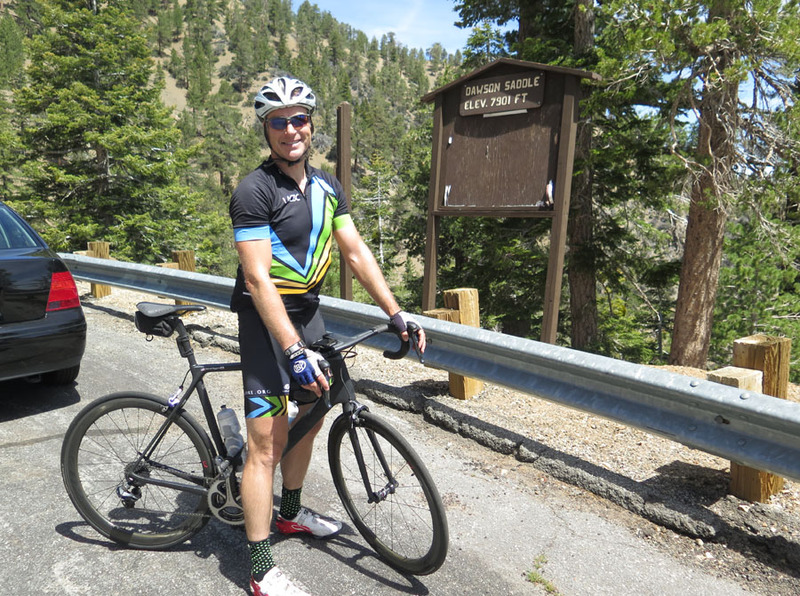 At 7,901 feet, I didn’t feel the elevation too much, but probably our slow ascent helped us acclimate. The descent provided a mainly unobstructed view to the north which gave us an edge of the earth feel as we rounded turns. Even though we saw a truck removing debris back and forth, we still had patches of rocks were had to maneuver through. 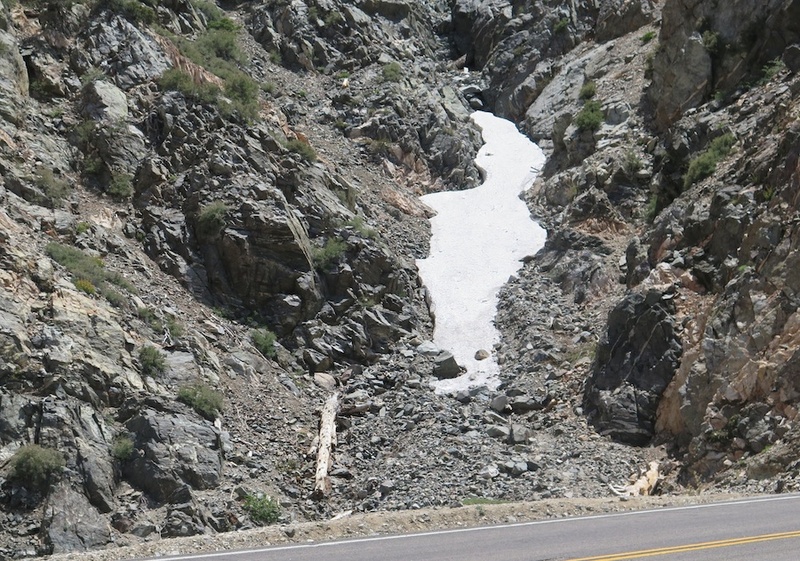 In the first mile of our downhill, we spotted some final remnants of winter. 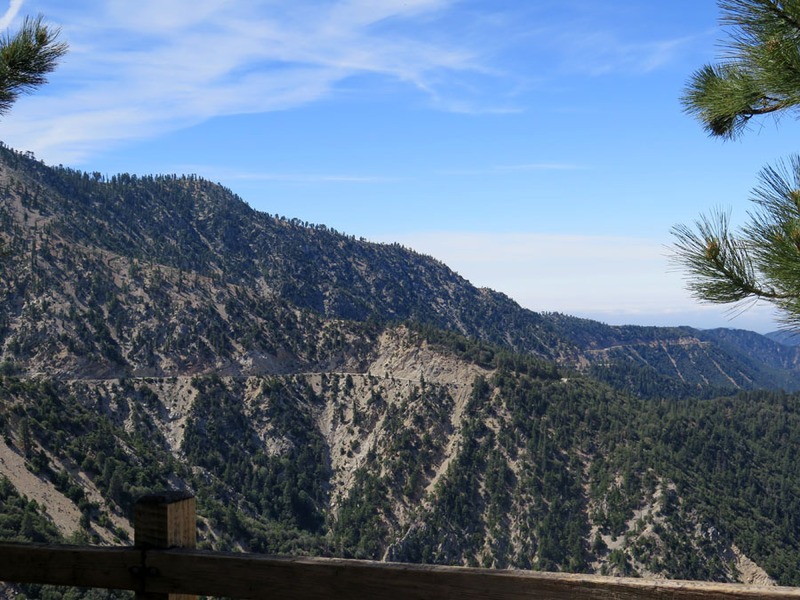 A few ice patches laced the northern hillside of Mount Baden-Powell and on our return trip a few hours later, I could have sworn the rest had melted. To the left, I could we the fire road I scanned off of Google Maps that leads to Grassy Hollow. Even though we were far away, it looked rideable and not that steep. I’ll put that memory in my back pocket for a future ride. 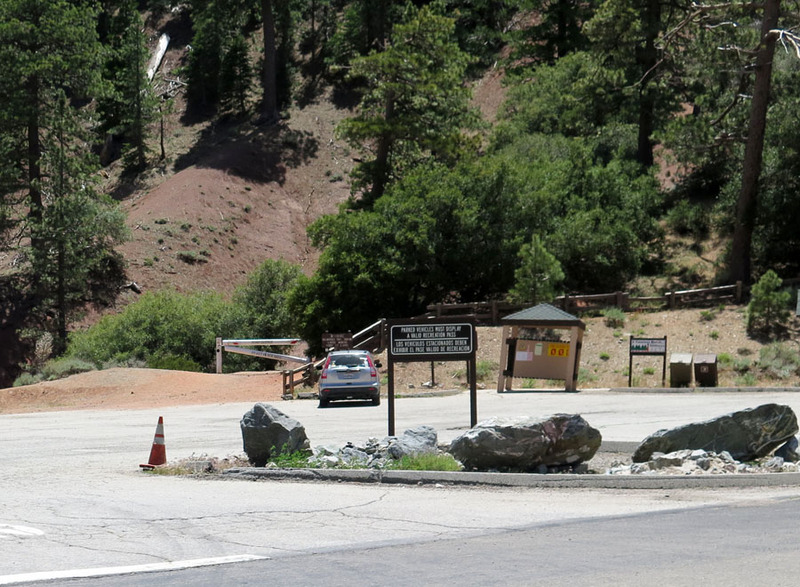 Before we started our final eastward climb, we bottomed out at Vincent Gulch Divide. This was a heavily trafficked parking spot for a weekday and we encountered many more drivers after this point. Probably this spot being an access point to the Pacific Crest Trail had something to do with that. 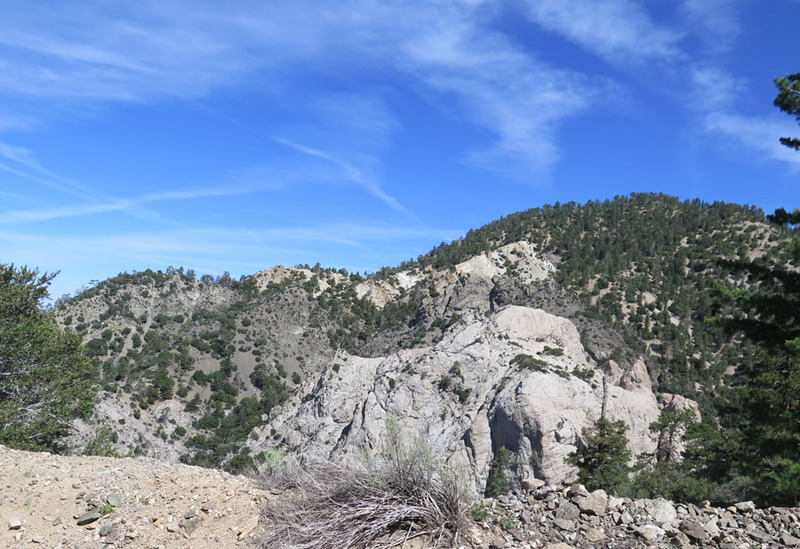 As soon as we started to climb, we could clearly see Mount Baldy, but I initially had trouble picking out which of the two peaks was the tallest. It was like an Escher drawing as every shift in perspective altered my choice until I concluded it was the one with snow on it dummy. The climb to Blue Ridge covers 3.25 miles with just 800 feet of gain. We were in no rush as this was more than an opportune place to take pictures. 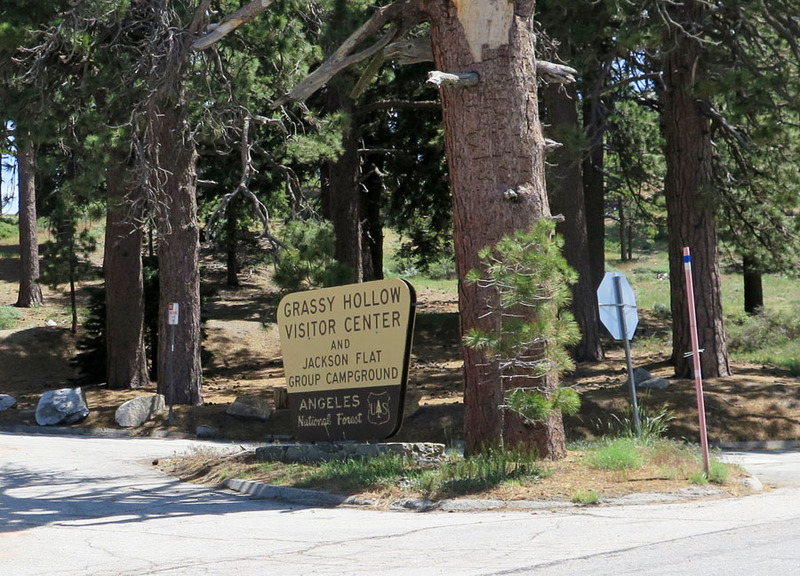 We brought three water bottles each, but stopped off at Grassy Hollow for a little refill. Although it had a water fountain, it wasn’t running. Bummer. There was another spout a hundred feet off the main building, but I can’t comment on its drinkability. Inspiration Point is properly named as you summit Blue Ridge. 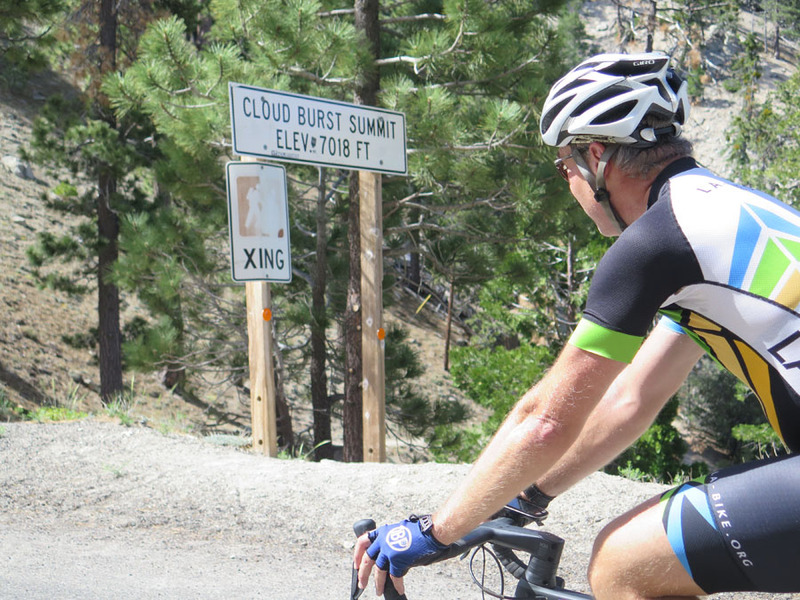 You seem on top of Baldy and the dirt road in front looks temping. Once again, that’s for another day. 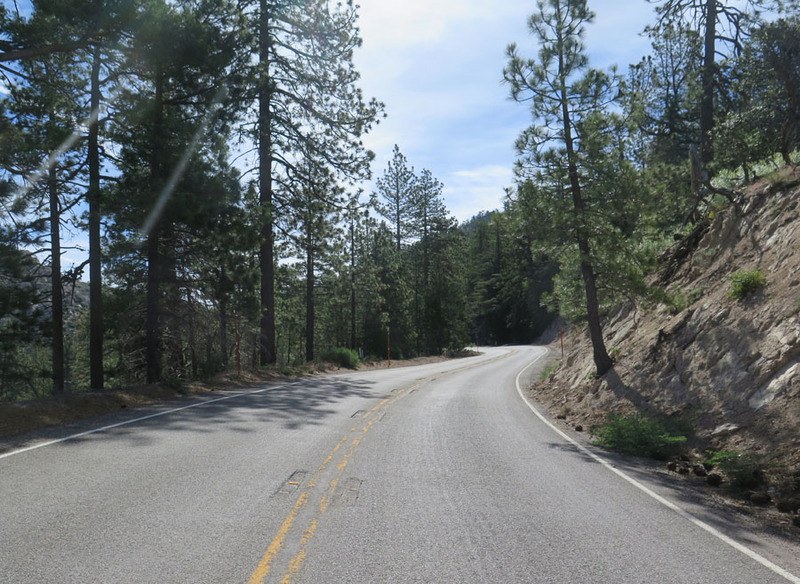 It’s only a two mile descent until you reach Big Pines which intersects at ACH and Big Pines Highway. This stone structure one the left is about one hundred years old and a sign that this was one of the earliest mountain resorts in the area. 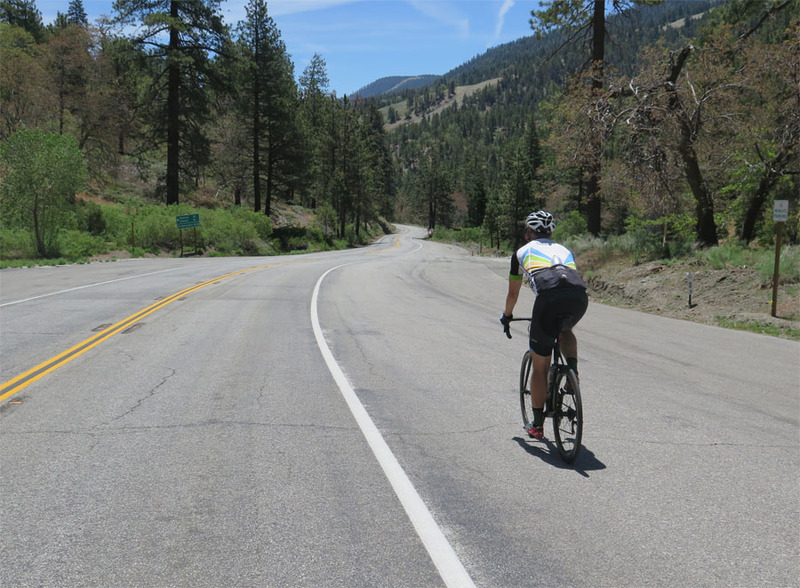 There’s still another 4.5 miles of downhill until you hit “downtown” Wrightwood. You’ll pass the popular Mountain High ski area along with number of homes and ranches along the hillside. Despite no snow, this is a year round destination. 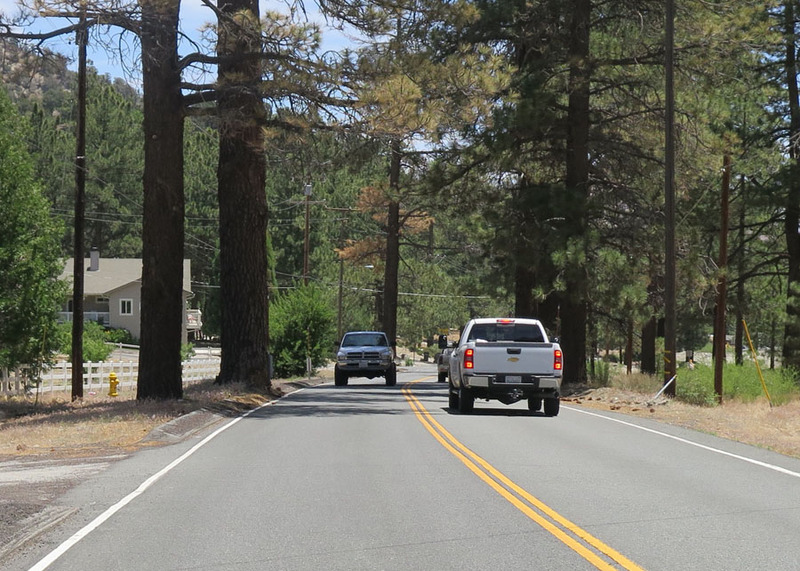 As you enter San Bernardino County, one thing to be wary about are the trees placed so closely to the highway. That leaves little wiggle room, but the drivers were accommodating. 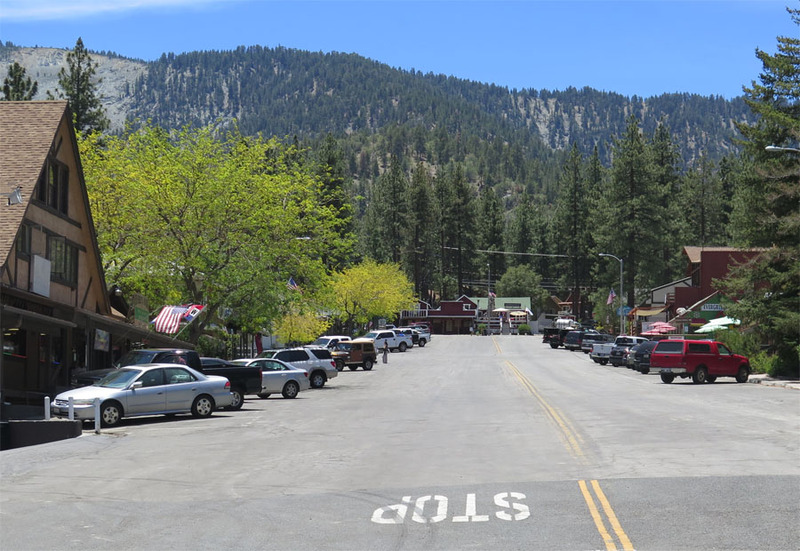 Wrightwood has a number of options to refuel. We chose heading into Jensen’s which attracted a lot of hikers. Bernd had a sandwich prepared for him which I bought a variety of snacks, although I was tempted by their robust beer selection. 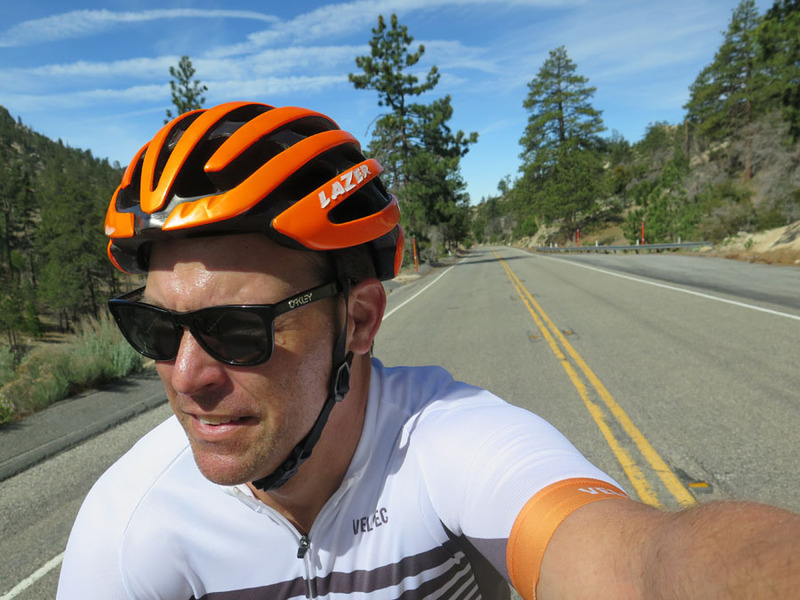 Even though the ride back covered the same route and almost as much elevation, even with more heat in the afternoon, it was still calming spending another 2 ½ hours on the bike. 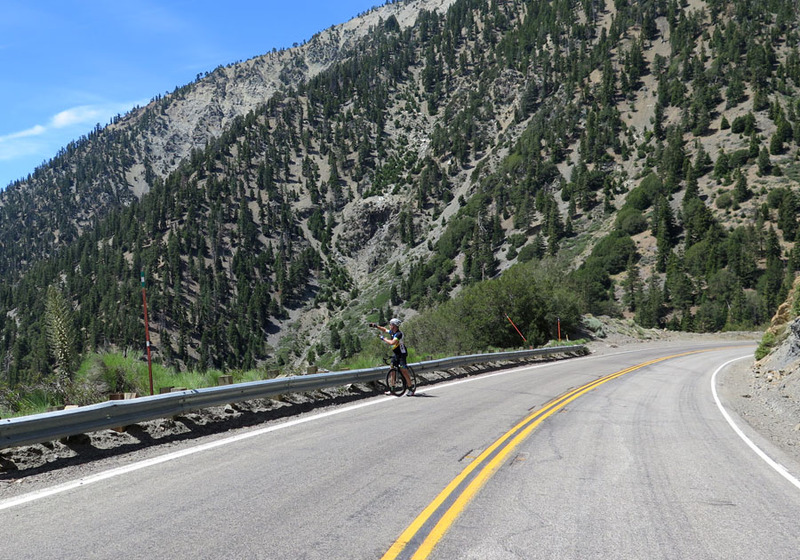 The Angeles Crest Highway is a vacation destination without driving vacation distance. 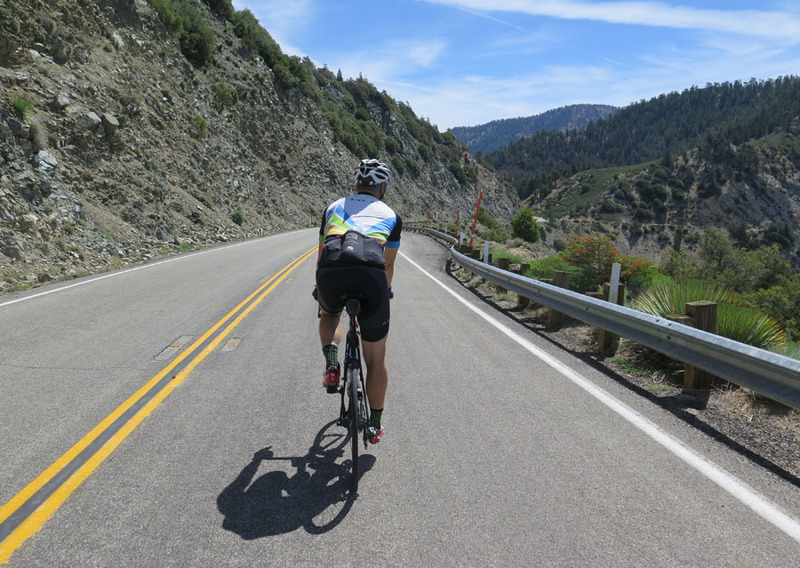 If you have the opportunity to do this ride, you’ll probably want to return sooner than later. More Griffith Park Circulation & Traffic Improvement on their way.